Acquired the Canadian arm of The Gorham Co. in 1907. 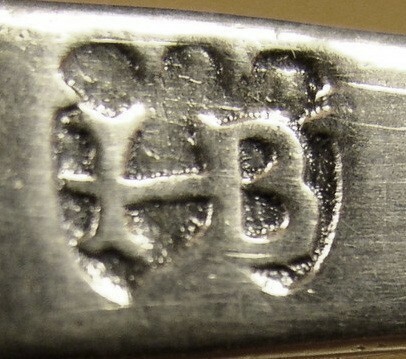 Makers of sterling flatware and holloware, a number of Birks and Gorham patterns are the same. William Bixler and Daniel L. Bixler. Arts and crafts style silversmith. Formerly Ball, Black, Co. Makers and retailers of quality sterling hollow-ware and a small line of sterling flatware. The present company no longer manufactures. Was in the partnership of McMullin & Black 1811-1813. Founded by Roswell Blackinton, Walter Ballou, and Thomas Mann. 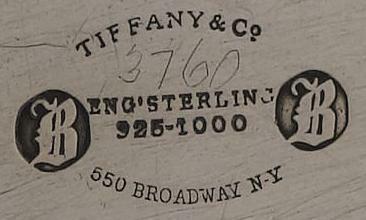 Makers of sterling flatware, hollow-ware, vanity items, and novelties. 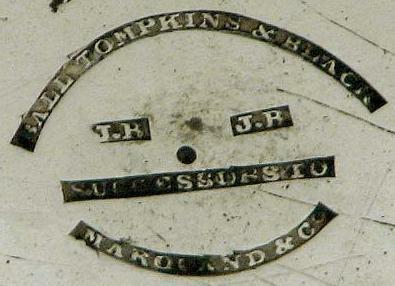 Purchased by Wells, Inc.; some of Blackinton's dies were acquired by Towle Silversmiths. Flatware Patterns by R. Blackinton Co.
Manufacturers of badges, military insignia, and swords. In the partnership of J.C. & F.S. Blackman with his brother John Clark Blackman 1849-1858. Worked as F.S. Blackman & Co. c. 1840. John Clark Blackman / J.C. Blackman & Co.
J.C. Blackman & Co. 1859-1870; and Blackman & Warner c. 1871-1872. Brothers John Clark and Frederick Starr Blackman. Was in the partnership of Blake & Lyon with Ira C. Lyon 1846-1848 and C. Blake & Co. with Joseph Bevan 1856-1868. Primarily a silverplater after 1868. Originally formed as Sturdy Bros. c. 1859. In 1885, James B. Blake & Edward P. Claflin purchased the controlling interest and became Blake & Claflin in 1885. The business was incorporated as the James E. Blake Co. in 1898. Makers of sterling cigarette cases, holloware, vanity items and jewelry. Their mark is an intertwined JEBCo. Porter George Blanchard, son of George Porter Blanchard, was a member of the Society of Arts & Crafts in Boston. Shortly after his move to Burbank, CA, in 1923, his father and brother, Richard, soon joined him in his workshop. In 1926 they went by the name Blanchard Brothers, but the shop was soon renamed the Porter Blanchard Shop. Makers of handwrought sterling flatware and holloware. Founders of the California Society of Arts & Crafts. 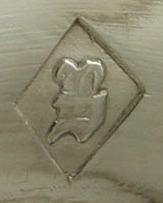 The profile mark has been used since c. 1933. Porter Blanchard died in 1973 and the Porter Blanchard Shop remained in business until 1993. Son of George Porter Blanchard. Worked at the Porter Blanchard Shop c. 1923-1930. Primarily known as a jeweler; also made small sterling items such as compacts and pill boxes. John Bliss and Frederick Creighton. Started out as as silversmiths and jewelers and evolved into chronometer and nautical instrument makers. Was in the partnership of J. & L. Bloodgood with his brother Lynott Bloodgood 1804-1810. Founded by Joseph C. Boardman. Acquired F.B. Rogers Co. and the Manchester Silver Co. in 1985. The company was sold to the founder's son, Burton Boardman, in 1985. The company moved to Meriden, CT, in 1992 and was renamed Boardman Silversmiths. Makers of sterling holloware, trophies, and jewelry. 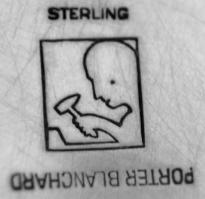 Would occasionally work in higher grade English sterling when the use of coin silver was commonplace. Produced silver mainly for Ball, Thompkins & Black. William Bogert / William Bogert & Co.
Was a partner in the firm of Eaton, Gordon & Bogert with William R. Eaton and John Gordon 1856-1860 then Gordon & Bogert 1860-1864. Went on to form the business of William Bogert & Co. 1866-1880 and was a major supplier of hollow-ware to Tiffany & Co. 1866-1868. Edward Bolles and Lucius B. Childs. Edward W. Bolles and Gerry Hastings. Silversmith and jeweler. Was in the partnership of Boon & Ormsby in Cortland 1832-1834. Partnership of Ezra B. Booth and his son Henry G. Booth. Partnered with his son in the firm of E.B. Booth & Son 1861-1888. Silversmith and jeweler. Maker of handwrought Arts & Crafts flatware and holloware. Was a partner in the firm of Maurel & Boudo c. 1810.